The revolutionary design of the Galaxy S8 begins from the inside out. Every part of the phone's layout has been rethought to break through the confines of the smartphone screen. So all you see is pure content and no bezel. It's the biggest, most immersive screen on a Galaxy smartphone of this size. And it's easy to hold in one hand. The Infinity Display has an incredible end-to-end screen that spills over the phone's sides, forming a completely smooth, continuous surface with no bumps or angles. It's pure, pristine, uninterrupted glass and it takes up the entire front of the phone, flowing seamlessly into the aluminum shell. The result is a beautifully curved, perfectly symmetrical, singular object. Capture life as it happens with the Galaxy S8 camera. The 12MP rear camera and the 8MP front camera are so accurate and fast that you won't miss a moment, day or night. Prying eyes are not a problem when you have iris scanning on the Galaxy S8. No two irises have the same pattern and they are nearly impossible to replicate. That means with iris scanning, your phone and its contents open to your eyes only. And when you need to unlock really fast, iris recognition is a handy option. You never really stop using your phone. That's why Galaxy S8 is driven by the World's first 10nm processor. What's more, with IP68, you can even work through rain or dust. If that's not enough, with external storage, you will never run out of space. Bixby completely changes the way you interact with your phone. It's a personal assistant that understands talk, text, and taps so you are never confined to one mode of communication. Also, it completely changes the way you search. Just open your camera app and show Bixby what you want. It's that easy. The Galaxy S8 is designed to be more than just smartphones. It's designed to change how you capture and view your life, whether it's in 360 degrees or in virtual reality. It's designed to change how you pay and work on the go. Break down the barriers in your world with the Galaxy S8. The Galaxy S8 is built to be more accessible for everyone. 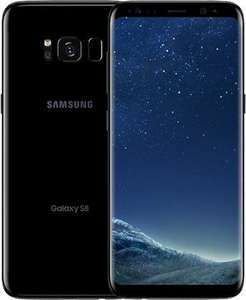 A well-thought-out range of technical solutions make it easy for anyone to make full use of the Galaxy S8 advanced capabilities. Just because I can't buy a new one doesn't mean you have to rub in that I'm poor! Why would anyone buy something rated "poor"
Poor condition I would imagine. Haha freeeeezing cold not even cheap for something that's probably awful. Cex rate things scratched to wotsit as good so dread to think what poor is.